Workplace accidents continue unabated at the district’s ship breaking yards as occupational safety measures are still largely nonexistent. Labour rights activists say workplace casualties have now become a regular phenomenon as government agencies concerned have no strict monitoring of yards. According to Department of Inspection for Factories and Establishments (DIFE), 43 workers died in the last three years at ship-breaking yards (19 in 2017, 20 in 2018 and four up to February, 2019). According to Young Power in Social Action (YPSA), an NGO defending worker rights and protecting the environment, more than 200 workers have died in the last 15 years at the ship breaking yards. After analyzing yard accidents over the years, it has been found workers mostly die from explosions or after coming in contact with toxic materials from ships. Accidents, including inhaling dangerous substances like carbon monoxide or falling from dizzying heights with no safety harness, are major causes of workplace injuries in the ship-breaking industry. Other causes of workplace casualties include workers getting crushed by falling steel beams and heavy plates, as well as cylinder, boiler, and generator explosions and electrical shocks. According to an International Labour Organization (ILO) publication, ship-breaking has become a major occupational and environmental health problem in the world. It is amongst the most dangerous of occupations, with unacceptably high levels of fatalities, injuries, and work-related diseases. Ship-breaking is a difficult process due to the structural complexity of ships, and generates many environmental, safety, and health hazards. It is done largely by the private sector and is rarely subject to safety controls or inspection. It also gives limited access to health services and adequate housing, welfare, and sanitary facilities further exacerbating the plight of workers, the publication points out. Tapan Dutta, convener of Ship-breaking Workers’ Trade Union Forum, said workplace casualties happen because most ship-breaking yards hardly follow occupational safety standards. "The procession of death at ship-breaking yards goes unbridled. Unfortunately, yard owners try to avoid paying compensation to families of victims. Accidents will come down substantially if the vessels are free of all hazardous materials before entering the country. Besides, workers at yards should be provided with adequate practical training," said the labour rights activist. Muhammad Ali Shahin, senior program coordinator of YPSA, said the alarming rise in accidents points to the poor occupational safety standards at ship-breaking yards. "DIFE usually shirks its responsibilities by lodging a case with the Labour Court following any workplace casualty at the yards. Therefore the authorities concerned, including government agencies and yard owners, should consider the issue seriously," said Shahin, who has been working in the ship-breaking sector for almost 18 years. At a meeting of the regional crisis mitigation committee held on March 4 of this year, the committee's member secretary, Abdul Hai Khan, said ship-breaking yards are supposed to have a functional safety committee, but most yards do not abide by the rule. "Workers suffer from exhaustion as they work overtime at the yards. The accidents arise from exhaustion," said Khan, also DIFE deputy inspector general. 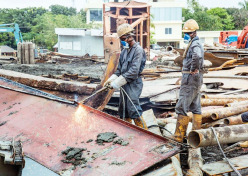 Palash Kumar Das, Inspector (Safety) of DIFE, said they lodged 18 cases in the last 15 months in connection with workplace casualties at the yards. Shubhankar Datta, Inspector (Health) of DIFE, said accidents mostly occur due to lax monitoring of yard owners. "As per Bangladesh Labour Act 2006, no worker can be engaged in work without providing him with personal safety equipment. The employer is bound to give notice of the occurrence to the Inspector by two working days of any accident. However, yard owners hardly give us notice following a casualty," said the Inspector. In conversation with the Dhaka Tribune, Md Abu Taher, president of Bangladesh Ship Breakers and Recyclers Association, said they were sincerely trying to reduce the number of workplace casualties at ship-breaking yards. According to Bangladesh Ship Breakers and Recyclers Association, out of 150 ship-breaking and recycling yards in Chittagong, only 60-70 yards are now in operation on the 25km strip of Sitakunda upazila in Chittagong.